There are some positives to being divorced. One towards the top of my list is guilt-free time away. Away from kids. Away from a spouse. Just good old-fashioned 'me time.' Sans the guilt. This is something I was never good at in my marriage. When I was married, I often got swept up in the day. Trying to work, be there for the kids, be there for my ex, grocery shop, clean the house, set up daycare, on and on and on. I used to call it the longest list of 5 minute tasks ever. I call it... 'Mommy Guilt.' Maybe men have it too, I don't know. However, as a divorced single Mom with split custody, I now am forced into time away from my kids and my ex-spouse. The guilt-free part has come on its own. And I'll admit it. I like it. At first I lamented every moment away from my kids. I'm still not fond of it. But, I've come to accept this as my reality. Beyond accepting it, I've come to embrace it. I no longer pine away at the quiet house, but use it for the 'me time' I often craved but was afraid to ask for. Because, there is nothing I can do about it anyway. My kids are with their father. I can sit at home and feel bad about it... but they are still in the care of their other parent. Or... I can enjoy that time. Because I'm recharged and re-energized which gives me a larger capacity in general. That doesn't make me selfish. That doesn't mean I don't want to be with my kids. I love reconnecting with my friends. Having the ability to stay late at work. Getting in a late exercise class or just watching a TV show. All without the guilt. The crazy part is... why did I feel guilty about this when I was married? I know I shouldn't have, but I did. It's one of my new resolves. One of my lessons learned to carry forward. While 'me time' is important, the guilt-free part is just as, if not more, important. 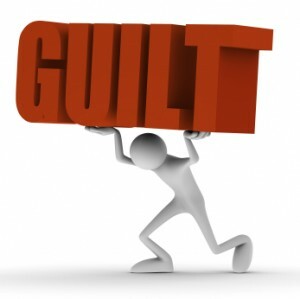 How do you make it guilt-free when you are not divorced? If I had that answer, I'd start my own business and set aside time to roll in the money.